(If you want to read what they are, find out more here). In ETMOOC, we are encouraged to share what we know to others in our Google+ community and already, the threads and posts are going wild with ideas, tips and hints from a community who shares the passion to learn about educational technology and how to apply it to their roles. For me, I thought that I’d answer the question by not only submitting this as part of the #etmooc requirements but also promote the portfolios I created (two kinds and you’ll see why below) as part of the Professional Learning Portfolio Workshop requirements. So I’m killing two birds with the one stone. How do I make my learning visible? During the PLP workshop, Jane Hart encouraged us to explore various PLP tools, select one and then asked us to select one to create our own online Learning Portfolio. Here are three I considered and the pros and cons of each. (a) WordPress – I considered using this site as my PLP and creating another drop down item on the navigation bar where I could upload information about what I was working on. However, I couldn’t attach documents and other learning assets I was working on – unless they were links to other sites where my work was sitting on. Unfortunately, my work happens to sit on various company sites behind their firewalls so this was impossible. Similarly, I couldn’t make certain documents private or manage privileges if I wanted to have audiences look at certain parts of the site. For example, my work is branded with company logos and colours and to make it publicly available without permission from the Branding, Marketing and Legal teams of that organisation was going against their policy. So instead I created another page on my website navigation bar titled, “What Am I Working On” where I listed the projects I worked on in that month but with no actual or reflection. It’s just a bullet point list of activities and in hindsight I’m struggling to find the value in this to a reader. Really who wants to know what I’m doing in that month apart from showing everyone how busy I am? I was in two minds about this page. I kept looking at it and hovering over the ‘Delete Page’ button in WordPress. To me, the list felt “empty” because it only served as a reminder that I should be writing longer blog posts on each dot point. The more I looked at it, the more panicked I felt. 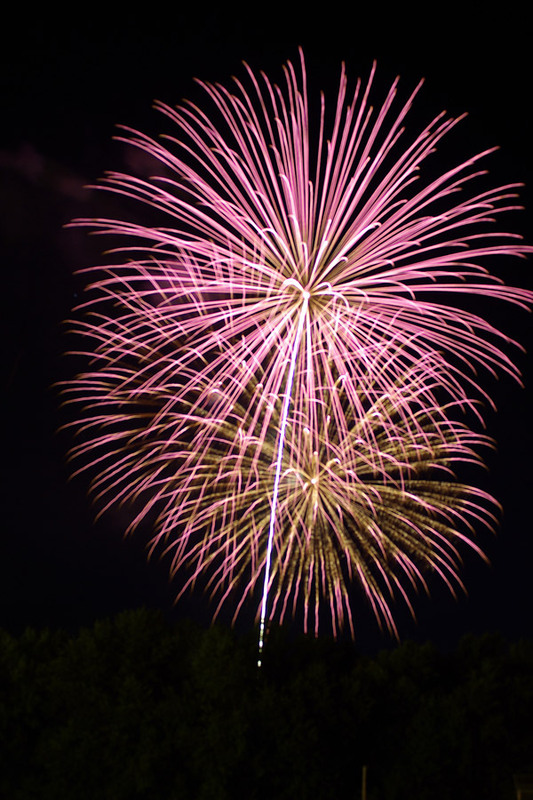 That is, until I saw a post by Cathy Beach (@beachcat11) who wrote that she found my page a good idea for recording her accomplishments every month and used it for her site! I was dumbfounded. It only goes to show that what you may think is of no value, others may think otherwise. You can read Cathy’s post here. 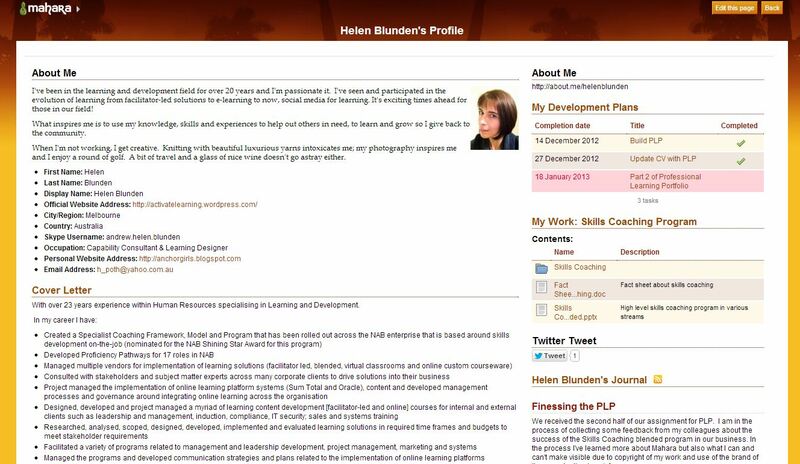 (b) LinkedIn – there is a section on LinkedIn called ‘My Projects’ and this was another possibility for my PLP. I’m an ‘old salt’ when it comes to LinkedIn as I’ve had my profile for many years and devote a little bit of time every month to continually update it. It’s the one social media site I keep current as it’s my connection with business networks. It’s also my downfall because all my managers and colleagues are on it lurking and can see what I’m up to, who I’m linking with and what I’m tweeting, reading or doing. This can be a good or bad thing. I didn’t choose LinkedIn for my PLP site because once again, it didn’t offer me the flexibility of privileges and managing access to documents to certain audiences however, it’s the one site that is portable from job to job; it’s a record of your networks; projects and client testimonials. (c) Mahara – in the spirit of ‘trying a new tool’ (as Jane Hart encouraged us to do), this tool was new to me. My friends in academia mentioned this tool but in the corporate world, it’s unheard of. 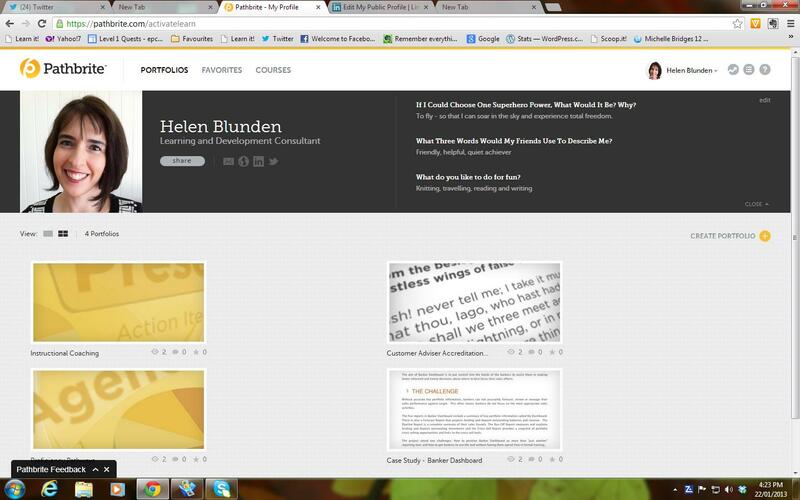 So I decided to create a personal folio on Mahara and you can see my PLP here. I spent many hours on this site trying to figure out all the functionality. I had considerable trouble linking certain web parts (eg LinkedIn profile not displaying) and my Professional Learning tasks not displaying. However it did have the flexibility of managing privileges and access to files. I didn’t find this tool intuitive to use but I did like that it had lots of functionality related around professional development and learning plans. Only after I played around on Mahara did I finally understand the concept of a Learning Portfolio (I had my ‘A-Ha’ moment) and that’s when more questions started to float around in my head about the application, accessibility, portability, privacy and security as I tried to piece together the pieces of how this concept may be used and implemented in a corporate workplace. One negative of Mahara was that it was a bit ‘clunky’ and not sleek. 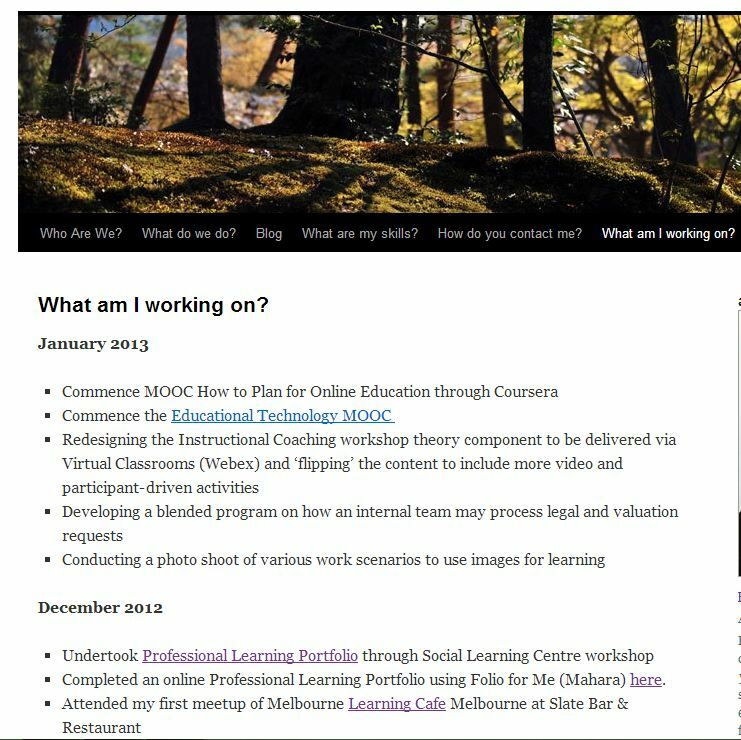 It looks like it’s something out of the web circa 1994 – the “brown cardigan of professional learning sites” so it needs a bit of an image overhaul so that it can appeal to a corporate audience. I know I shouldn’t worry about how it looks because it’s about the functionality – but it really does matter. In this day and age of online branding and reputation, this is critical. Let’s face it sometimes corporate Learning and Development teams have an image problem and I believe that the look of Mahara on the Folio for Me site is just compounding it. What would you prefer? This…. Pathbrite allows you to create sleek online portfolios and upload all sorts of various files. You choose various templates and create a short description of your work. It’s easy and fun to use. I created a snapshot of my online portfolio and uploaded three projects of mine. Before I knew it, I was scouring my hard drive for my old work projects to upload and my Saturday afternoon disappeared. So what do I do with two PLPs? Well I decommission Mahara and send it to the great wasteland of discarded websites to lie forgotten besides my MySpace account. Doing this course was timely. One day, my manager asked me to track the informal learning activities of our business unit through a spreadsheet. I stared right through him in disbelief numbed into silence as a slow sheen of perspiration covered me at the mention of ‘Excel’. Obviously I didn’t like this idea. Our organisation’s LMS is not used to track any experiential learning so this was going to be a great imposition on my time. Any time spent on an excel spreadsheet for me is time wasted when I should be working with our business. He knew the real answer to my first question but he also needed to have records that learning was being completed on-the-job to be able to advise his managers. (It’s a pity that L&D need to continually justify their existence this way – but this is story for another day). I understood where he was coming from but what resulted was that I was spending a part of my day calling up various team leaders to obtain data from them as to who completed informal training on the job, filled out an excel spreadsheet which I emailed weekly to all stakeholders (who promptly deleted the email and the report). The whole process was painfully boring to me – especially when we could use an LMS to generate the reports we needed. Unfortunately our LMS is not ‘customised’ to enable users to create their own learning activities and generate an online learning portfolio. Instead, there is only a record of formal training completed, their skills and qualifications. 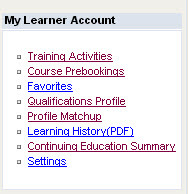 Here’s a screen shot of the morsel of what comes back to you in our LMS. Surely we have the functionality of recording informal learning activities on our LMS. I think we don’t have it because someone decided to ‘turn off’ this functionality. Rather than continue to do these dreadful spreadsheets, wouldn’t it be best if I just go and speak to the LMS team in Corporate L&D HQ who can tell me what is possible and what’s not…and turn on this functionality? This question echoed in the corridors, tumbleweeds rolled by and my response was crickets chirping. After I explained what a Learning Portfolio was, how they could be used to capture experiential activities in the workplace and record all the learning activities for staff, they agreed that the idea had merit but it was a new concept that was never brought up before. The steps of how to make it happen were unclear. Is there going to be a cost? Who would scope this project out? Who were the stakeholders? Who were owners of the project? Who’s going to do all the work? (Eyes darted around room). Although I received a general consensus that learning portfolios are a good idea in theory, (in fact, Karen Barnstable outlines 41 Benefits in her blog) it was agreed that it wasn’t a critical business requirement…currently. “There would need to be a cultural change about how our people record their formal and informal learning – some may not even bother. And so, I went back to my own desk and contemplated my next steps. I asked the question to my team here and also a couple of Learning and Development colleagues in other organisations and they too confirmed that they hadn’t heard of them in the corporate world (Australian market at least) – nor were they mentioned in any corporate learning conferences. For themselves, many kept records of their own work in their computers at work or home or archived on CDs or DVDs. Rare that anyone kept their work ‘in the cloud’, or shared what they had done in previous organisations or projects. None blogged or shared their work on social media sites. Looking around my team, it dawned on me that we all had created content in some form or another over the years in different organisations but we had never talked about our creations! How did we come about them? What did we learn? What was the result? Why did we come up with that particular solution? What business problem did it solve? Do we have similar problems in our business that we can reuse their content? All our ‘stuff’ was hidden away in the shared file drives of our company, lost and long forgotten. So if the Learning and Development team was doing it imagine the rest of the organisation’s content that no one was talking about, lost and forgotten deep in the folders and sub folders of share drives. We know that in concept, the professional learning portfolios for an organisation are a great idea but it’s the practicalities that will be difficult to implement. I have sown the seed with Corporate L&D HQ but I don’t know if that seed would germinate without the light of an influencer and the sprinkling of a budget. Maybe also a team who I could pilot and show the value of PLPs? Certainly the question about the technology or platform will arise and this will bring its own obstacles and impediments – namely the lack of portability. But really is this a major issue at this point in time? I don’t think it is. If anything, let’s remove the portability issue and use it as an opportunity to inspire people to record their learning for the time being and get into the PRACTICE of reflecting on their own work, connecting with others through it and sharing their learning. Let’s not get distracted with what tool to use and why, just start – this can be sorted out later on. This way, those who see the value will realise that there are benefits of their PLP sitting on an external platform and who will then have the skills to seek out those and create their own PLPs without relying on the company to provide this. Another issue is that by using external sites, the company may not allow their employees to display anything that can be attributed to that organisation. For example, with my work, I had to strip out all the logos, colours and branding so the work is not identifiable to the company in line with company policy. Unsure of how the company will grapple with them but for me, it’s crystal clear. I have to create my own PLP, continue this blog and network with my PLN if I’m to make any sense of today’s workplace and its challenges. It’s strange but I feel that this is so important to me that if an employer denies me the ability to write, reflect and use this media, I would get quite upset and frankly, make a decision not to work for them. It’s come to that. Or you create your own in the meantime and wait for the others to come onboard when they’re ready. Thanks Debbie, much appreciated. It’s been a work in progress since the PLP program started and it’s been mulling in my head as well as various discussions with people at my company about the usefulness and applicability. Everyone agrees that they have merit and are worth looking into. However sometimes business pressures overtake us and as there are other critical programs in progress – and it’s only an idea at the moment, we’d need to sit down and really make a case for it. However, that doesn’t stop us in the meantime. We can continue to create our own and share other ways until the ‘new way of working’ is worked out. From what I have seen in our company, L&D are open to new possibilities but like anything (I do it too), there’s an initial skepticism or hesitation in the change but this gets overcome when they see the benefit. In the meantime, the best thing we can do is to continue to learn and develop ourselves so that we may find our place in organisations. Perseverance….if I had a dollar every time…. Still, slowly but surely I’ve had some success with colleagues who are now interested to learn more and exploring things like MOOCs, Twitter and Virtual Classrooms. Last week, I even shared an Evernote notebook on Mobile Learning to one of my colleagues and they said, “what’s that?” so I may have converted someone to Evernote now…. Great post. It was good to see the issue of ePortfolios from someone outside of education. Thanks for sharing.